The UML-31 Control System is well known as a high-quality product, offering a wide range of applications for low to medium rise projects. 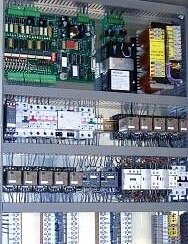 The UML-31 offers fully tuned up control: up to eight elevators in one group, in serial communication mode, may be connected to establish a multi-car group control. The UML-31 control system comes in three basic software versions: 2-speed,Hydraulic and variable speed for vf drive units.